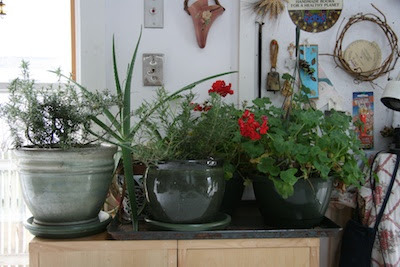 Sometime way later in the season than I should I bring a few plants from outside in for the winter. This year it is two geraniums and two rosemaries. 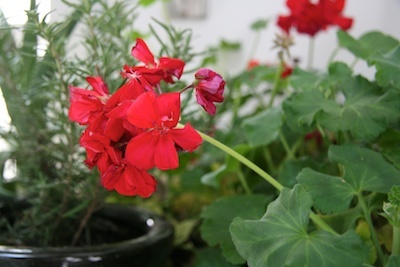 I usually prefer geraniums (well technically pelargoniums ) in colors other than red but when I found these toward the end of the season at KMart for $5.00 each, I decided that red was quite a nice color. And now I'm really loving it here in the studio. As for the rosemary, I have only once had plants I brought in last through the winter. I'd appreciate any suggestions for keeping them alive for next spring bearing in mind that they were brought in late and abruptly. I'm hoping that the warm fall we are having will make the transition a little easier for them. use a halogen spotlight, the colour spectrum is close to sunlight and it will help keep your rosemary warm and dry and water once a week sparingly they don't like soggy roots, think of replicating the harsh rocky windswept limestone country in the Mediterranean! I'm not sure where you are - but my rosemary lives outside throughout our winters in north GA - we get full on frosts and some snow. In fact it stays green and I continue to use it -- same with parsley.